Although I swore I would eat at Alinea after dining at Boka last summer, my hopes were dashed when I learned that the restaurant would be switching to the same ticketing system used by Next, and that the transition would occur dangerously close to my Chicago departure date. However, due to the relentless efforts of Scott, the same fine fellow who secured our Next tickets, we learned that we would dine at Alinea the following night. To the left of the main entrance was an aluminum washtub half full of cold water, on which floated a collection of spherical glasses filled with a small splash of lemonade. We sipped, wandered down the hallway, and deposited our empties in a small basket waiting beside the entry to the dining room. We were ushered into the upstairs room and seated at a table for six by the front window, and the meal officially began. I don’t have photos of each dish. Some are meant to be consumed quickly before they either melt or cool off, so out of respect for the chef’s wishes – and my desire to experience each dish as it was intended – I refrained from photographing everything. If you’re curious, you can find photos of the missing dishes online. These blocks of ice, with a small, liquid-filled well in the center, were set before each of us. We were then given a glass tube packed with roe and herbs and instructed to set the tube into the well and slurp up the contents. The effect was like a quick shot of champagne and caviar: salty, sweet, and cold. 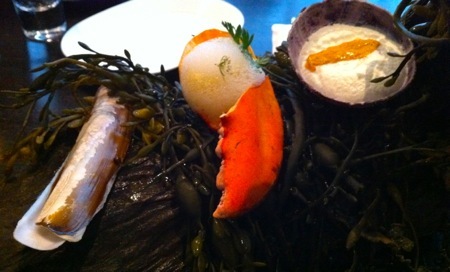 These four shellfish courses were presented together on a seaweed-draped piece of driftwood (the king crab is not in the photo). Each was a perfect bit or two of rarefied beach food. The combination of white chocolate foam and sea urchin roe was the standout. No photo here, this is the single bite course served at the end of a long wire. It was a slice of cured mangalitsa ham topped with a spray of tiny squid tentacles. Summer means tomatoes and tomato salads. 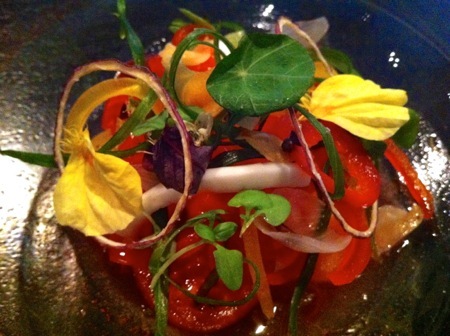 This version included sliced red chile peppers, watermelon, and the same nasturtium garnish we had on the zucchini at Next. Simple, refreshing, and beautiful to look at. I had opted for the complete wine pairing to accompany my meal. I had dutifully taken note of the brut and Riesling when they were poured, but paid particular attention to the sake served with the salad. I’m trying to learn more about sake, so when I asked the sommelier about what I was being served he was all too happy to educate me. 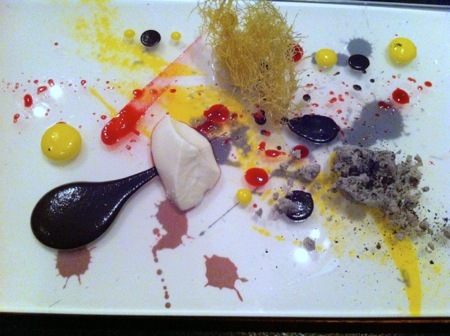 It was then that I realized how subservient the Alinea wine program was to the food. During our conversation about drop-fermented sake, I realized that I had made a friend for the rest of the evening. I should mention that not one bottle that was served was something I had heard of before. If summer tomatoes are served, can corn be far behind? This impressionist presentation combined sweet corn purée, huitlacoche (both puréed and freeze-dried), sour cherry syrup, and fried corn silk. Essence of the ocean in a bowl. Buried beneath the lime foam were little cubes of fatty tuna belly. 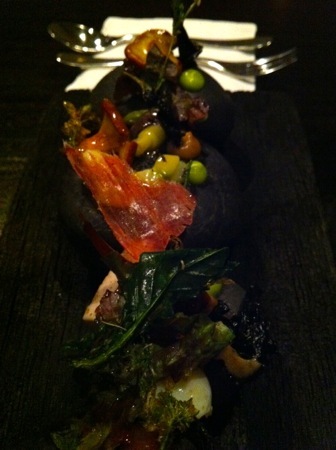 It’s difficult to make out in the photo, but this dish was served on a charred oak plank supporting heated river stones, on top of which the mushrooms rested. Although the dish wasn’t smoked, the smell of the smoke alone added depth to the taste of the grilled mushrooms. 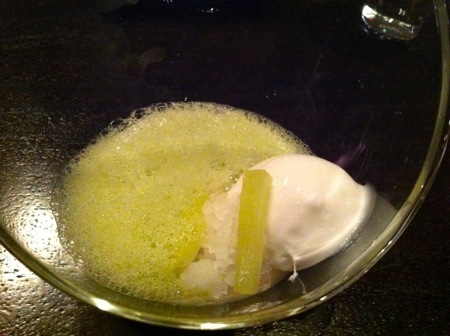 No photo here, but this dish is one of Chef Grant Achatz’s greatest hits. We were each presented with a small paraffin bowl containing soup, over which a cooked potato, a piece of truffle, and a cube of butter were suspended by a metal skewer. We had to withdraw the skewer, dropping the garnishes into the soup, which we slurped down in one gulp. By the time we were done, the plates of garnishes were empty. 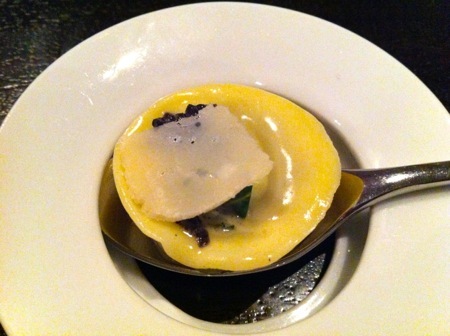 Another greatest hit, this was a single raviolo filled with spherified black truffle juice. Eaten in one bite, it “exploded” in my mouth. This was tempura-batteed brie with onion, served at the end of a smoldering cinnamon stick. The serving piece is called “the squid,” and is used for a similar dish in the fall that substitutes pheasant, apple, and an oak branch. When this dish was served, the opening in the center pedestal was sealed with a glass stopper. 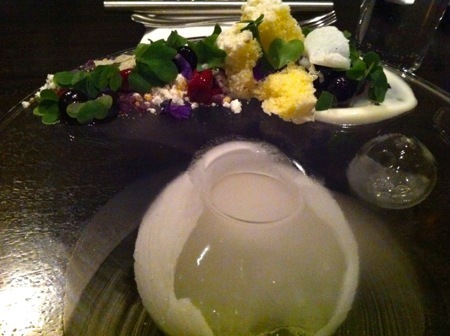 When we removed the stopper, the drink was poured in, generating “smoke” from the dry ice at the bottom. We ate the blueberries and cake, and sipped from the drink with supplied glass straws. 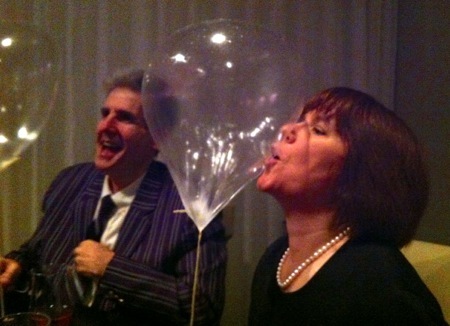 Yup, apple taffy balloons filled with helium. We all took the opportunity to offer serious literary criticism with squeaky helium-chipmunk voices (“A Song of Ice and Fire is both grossly over- and underwritten.”). Pictured here are She Who Must Be Obeyed and Scott, Wrangler of Reservations and Wearer of Snazzy Boating Blazer. The meal ended with some dinner theatre: The table was covered with a silicone mat, and small dishes full of colored stuff were set at either end. Two chefs came out and set three large hollow white chocolate shells in the center of the table. 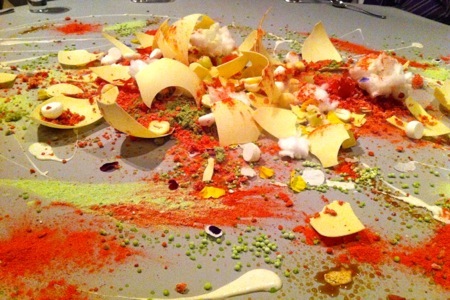 They then proceeded to scatter the contents of the dishes across the mat, announcing each ingredient: freeze-dried english pea pellets, strawberry powder, sherry powder, and buttermilk cream. When they were done, they lifted up the shells and let them drop down and shatter, revealing their contents: meringues, lemon cotton candy, more of the powders, and miniature olive oil filled jelly donuts. We were invited to eat off the table, so we attacked the mess like little kids, trying different flavor combinations with each spoonful. It was a spectacular end to a spectacular evening. Before leaving, we were each given a copy of the menu (full photo here) and the key to deciphering it: the size of the circle indicates the relative size of each course, and the position indicates its placement on the savory (left) to sweet (right) spectrum. 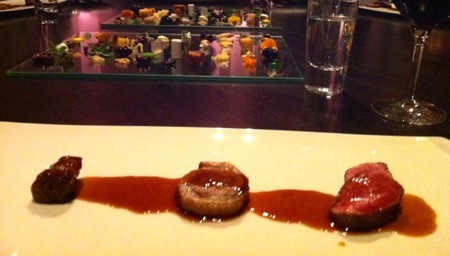 It’s difficult to describe the experience of eating at Alinea, although a few have tried. 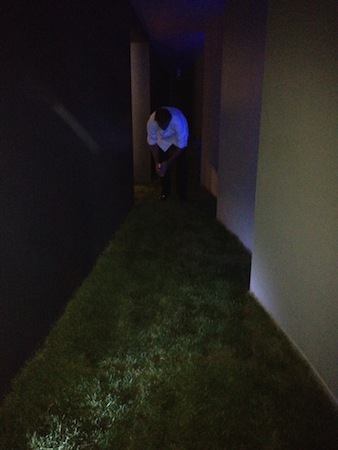 I’ve had brilliant, technically perfect meals at Per Se and Jean Georges, but neither of them were as much fun as Alinea. It wasn’t that the others didn’t incorporate playful elements, it was more about how much thought and care had gone into incorporating all of the senses throughout the Alinea experience. We left dazed and happy, but as soon as we returned to the hotel, She Who looked at me and said “We have to do that again.” And who am I to argue with my attorney? ETA (9/18): Be sure to read Scott’s account of the same meal. This entry was posted in food & cooking, travel and tagged cooking, food. Bookmark the permalink.